Location map for Great Sand Dunes National Park and Preserve (dune area shown in yellow). 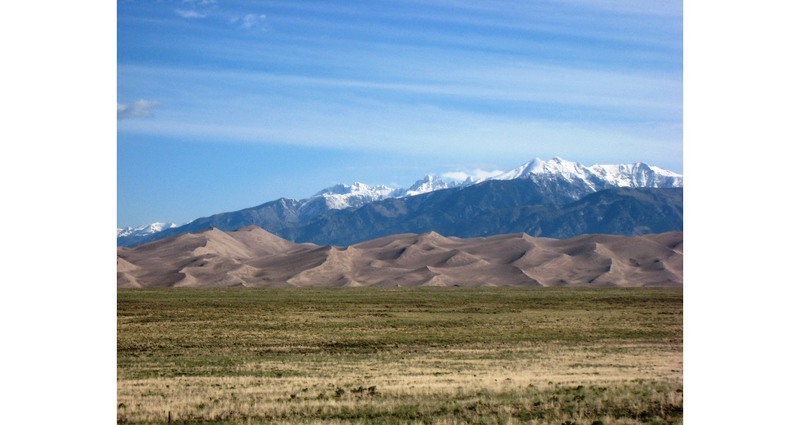 (Source: Richard Madole, USGS) The Great Sand Dunes occupy a small portion of the eastern edge of the San Luis Valley, the largest intermontane basin in the southern Rocky Mountains. The current valley is part of the Rio Grande rift that extends more than 1,000 km from northern Mexico to these mountains. The San Luis Valley portion of the rift is 220 km long and 75 km wide. It is closed off in the north by the convergence of the Sangre de Cristo Range with the San Juan Mountains to the west, and in the south by the same Sangre de Cristo Range meeting the Tusas Mountains. 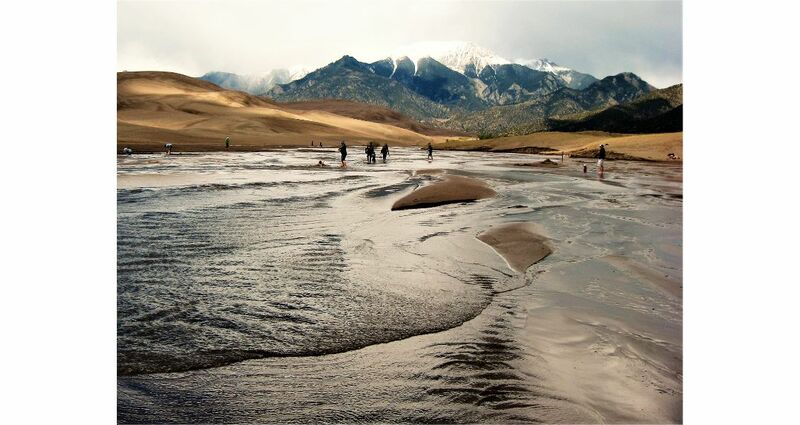 Visitors to the Great Sand Dunes National Park have access to desert dunes, dry lake beds, and small streams that disappear into the valley. Above the valley, one encounters pinyon pine and aspen groves in the foothills, spruce and fir forests higher up on the mountain slopes, finally culminating in high alpine tundra and the rocks of the area’s two tallest peaks, Crestone Peak (4,357m) in the north and Blanca Peak (4,372m) in the south. 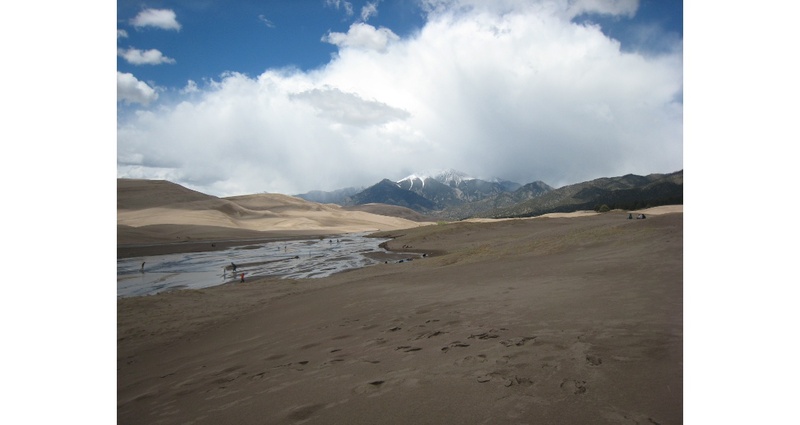 For the past decade, Dr. Madole’s research has been focused on the history of water table fluctuations near Great Sand Dunes National Park, as well as the surficial geology and geomorphology of the Great Sand Dunes area. A recent paper on the subject, published in 2013 with co-authors Mahan, Romig, and Havens, uses detailed mapping, stratigraphy, and new age dating to help solve the mystery of the age and origin of North America’s highest dunes. 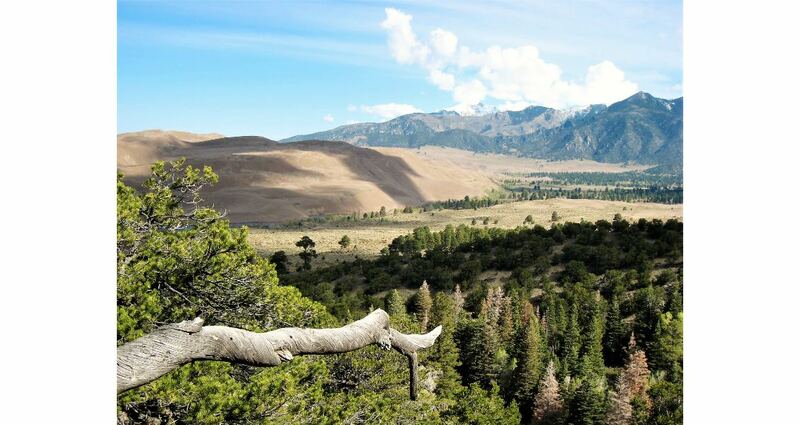 In 2016, Dr. Madole and others published the Geologic Map of Great Sand Dunes National Park, Colorado, which contained further details from their excellent field studies. “Our findings published in these two papers involved a variety of Quaternary studies and methods aimed at making the first surficial geologic map of the Park,” says Dr. Madole. “We used LiDAR, Landsat (satellite) imagery and aerial photography, as well as subsurface stratigraphy from logs of several hundred wells ranging from a few meters to 120m in depth. To characterize, correlate and date the surficial deposits, laboratory analyses were conducted, including particle-size analyses, X-ray powder diffraction (XRD) of minerals, trace elements and heavy mineral analyses, fossil identification (ostracod and diatom), radiocarbon, and optically stimulated luminescence (OSL) ages. The dune field sits in a bow in the mountain range. Prevailing winds are from the south-west (bottom left) across the valley toward the mountain range. Note how the dune field has deflected streams exiting the mountains. (Source: NASA/NPS) Two things are necessary for a dune field like the Great Sand Dunes to form – an abundant source of dry, sand-sized grains, and a smooth surface free of non-erodible elements such as vegetation and rocks. It then requires some wind to move the sand to a location where it can accumulate. 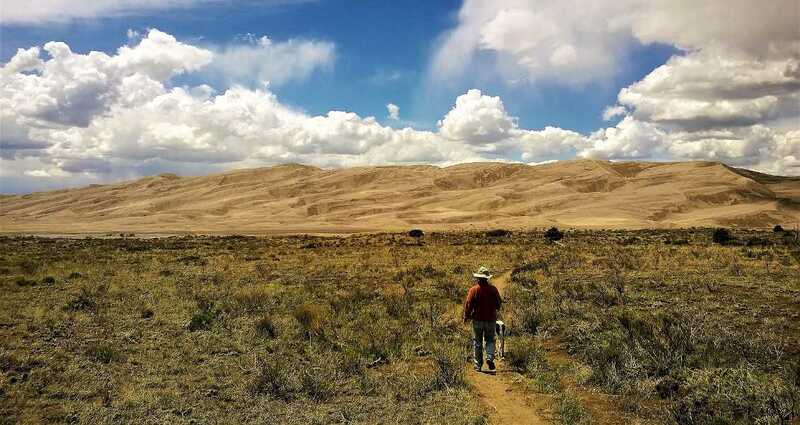 Research by Dr. Madole and others has revealed that the nearby source of sand (see section below, 'Material Source and Dune Formation') for the dunes was the floor of the closed basin that occupies the northern portion of the San Luis Valley. Before the Pleistocene glacial periods, the Rio Grande and other streams entering this valley delivered miniscule sediment loads when compared to those received during glacial periods. 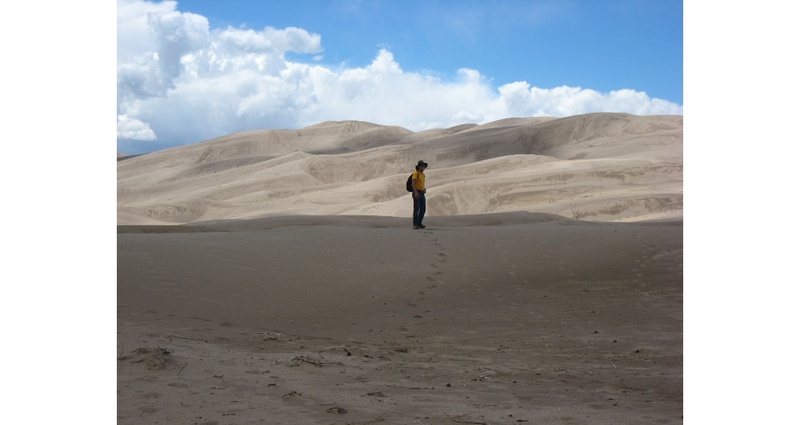 It took the high fluvial energy generated during glacial times to deliver the large volumes of sand across the San Luis Valley needed to form the dunes. This conclusion alone eliminated the suggested older Miocene and Pliocene origins for these great dunes. 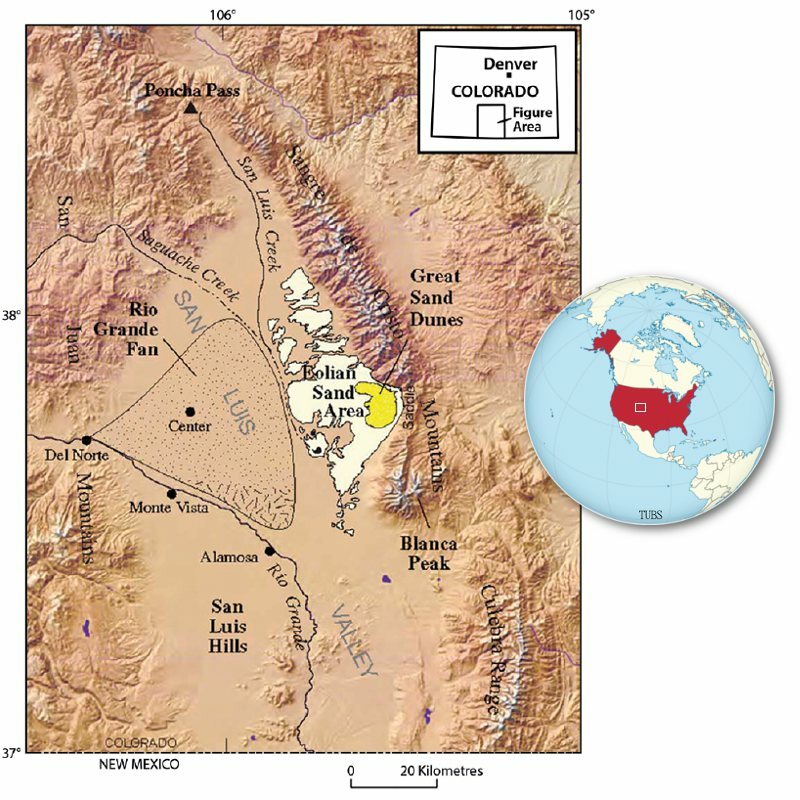 Further evidence for eliminating these earlier dates lies in the fact that the formation of Lake Alamosa during the middle Pliocene would have blocked sediment delivery across the valley. This body of water, which episodically covered a large part of the northern San Luis Valley, was formed when the Servilleta Basalt (3.66–4.75 Ma) dammed the Rio Grande River. The draining of this lake about 440,000 years ago would further help researchers narrow down the timing at which dune formation could commence. The park is easily accessed from several major highways crossing the valley, and a paved park road connects the highways with the visitor center, campground and parking areas adjacent to the dunes. From the dunes parking area, visitors can cross Medano Creek and hike to the top of the highest dunes. This can be quite an adventure as there are no trails but as one climbs higher into the dune fields, the spectacular mountains come into view across this ocean of sand. Access to the dunes is a short walk from the numerous parking areas. The park offers a wide variety of recreational opportunities, including hiking, with pets permitted on leash (most national parks do not allow pets outside parking areas), camping, fishing, sledding and sandboarding, as well as simply enjoying the scenery and exploring the many ecosystems that range from high desert to alpine tundra. Detailed mapping placed the dunes directly overlying a westward thinning wedge of debris-fan deposits derived from streams exiting to the west out of the Sangre de Cristo Range. This wedge of the piedmont/slope deposits progrades into the valley and over Lake Alamosa sediments. Since the dunes overlie the proximal portion of this sediment wedge, their formation had to occur after both the deposition of those sediments and the draining of Lake Alamosa, further narrowing the time at which dune formation could begin. 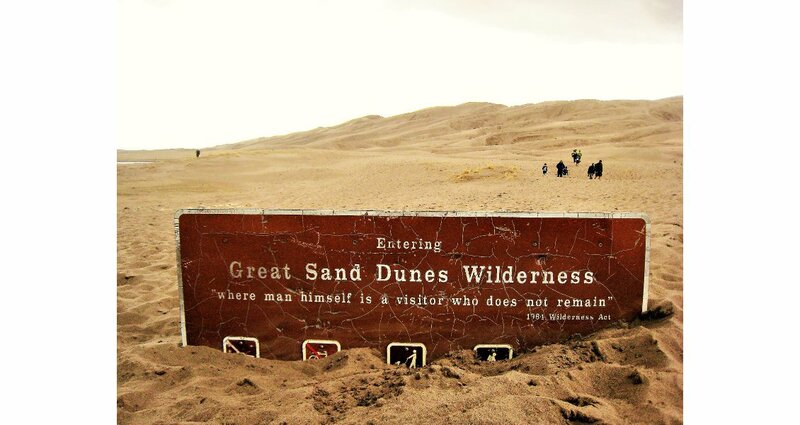 By observing that streams exiting west from the Sangre de Cristo Range have been deflected by the Great Sand Dunes, Dr. Madole and associates were able to establish a minimum date for the age of the dunes. They observed that the preserved zones of oxidation and weathering profiles associated with the redirected stream deposits near the mountain front were comparable to those of nearby Bull Lake till (next to last glaciation period). This contrasts with the lack of such oxidation observed along stream deposits from the last glaciation (Pinedale). Comparing the thicknesses of oxidation allowed them to date the deflected stream channel deposits to be at least as old as the Bull Lake glaciation, which ended at about 130ka, and thus conclude that the Great Sand Dunes began to form prior to that time and sometime after 440ka. Recently obtained OSL ages of eolian sand along Medano Creek support the 130ka date. Along the valley floor adjacent to the dunes are many unique features, from shallow or dry lake beds to these interesting grass rings. Ring muhly, the clonal grass pictured here, starts out as a small clump that increases in diameter over the years as one single individual grass. Once it has reached a diameter of about 30 cm the center dies out, leaving a hollow ring that gradually grows outward. 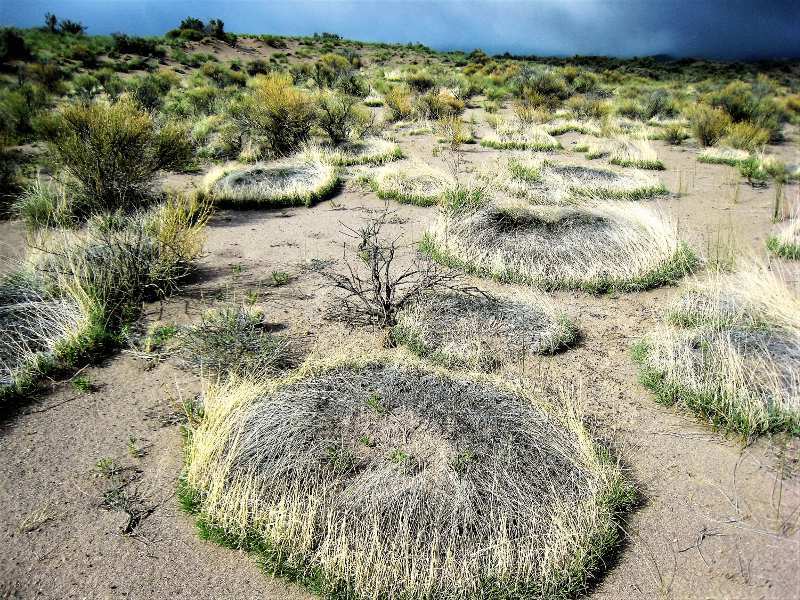 The arid environment is responsible for this circular growth. (Source: Thomas Smith) Now that the age of the dunes has been narrowed down, the formation of these deposits becomes less problematic. Early hypotheses for dune origin and source for the eolian sand varied extensively. 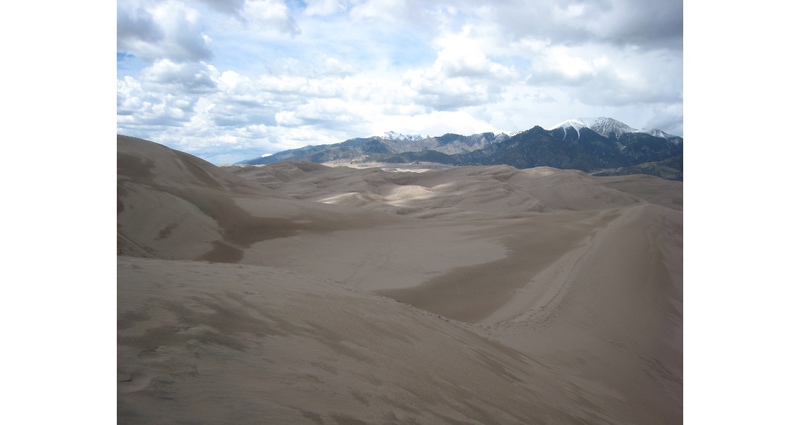 “Our research into the composition and age of material from the Great Sand Dunes indicated that only about 11% of the material found here was derived from the rocks in the Sangre de Cristo Mountains,” says Dr. Madole. “The vast majority of the material was derived from the San Juan Mountains located over 70 km to the west and we needed to explain how it was transported east across this valley. “Referring to published water budget figures, nearly 90% of the inflow into the San Luis Basin comes from the San Juan Mountains, with the Rio Grande River the largest watershed flanking this basin,” Dr. Madole continues. “Past inflows were likely similar. 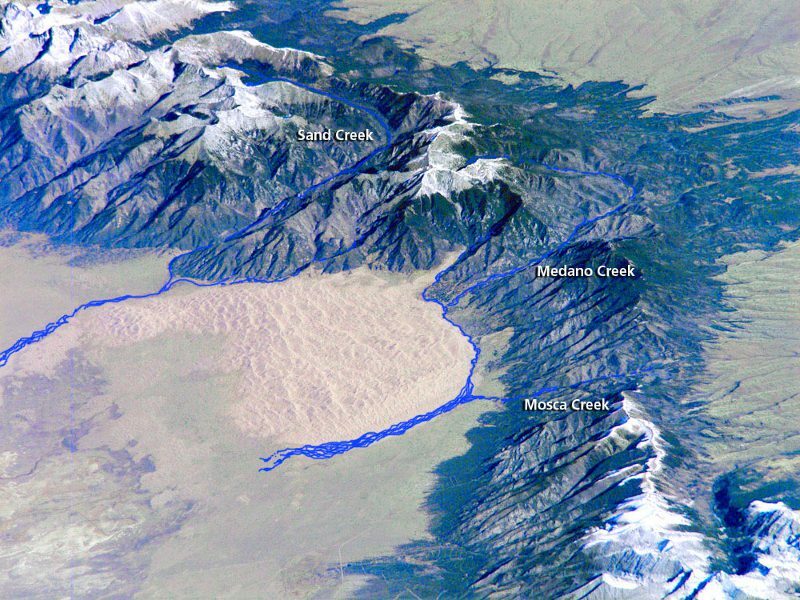 During the latest Pleistocene time, the Rio Grande drainage was highly glaciated and meltwater carried huge volumes of sediments into the San Luis Valley, forming a large alluvial fan. This fan extended far enough east to deflect the San Luis Creek that flowed along the east side of the valley. A very special thank you goes to Dr. Madole for his information and review. 'Geologic map of Great Sand Dunes National Park, Colorado.' Scientific Investigations Map 3362. Prepared in co-operation with the National Park Service. R. F. Madole, D. P. VanSistine and J. H. Romig. 'Constraints on the age of the Great Sand Dunes, Colorado, from subsurface stratigraphy and OSL dates.' Quaternary Research, vol. 80, issue 3, 2013. R. F. Madole, S. A. Mahan, J. H. Romig, J. C. Havens. Legend has it that the Scottish North West Highlands is where the Norse gods practised their mountain building skills before they created Norway. The dramatic landscape with glaciated fjords surrounded by high, alpine mountain tops makes a visit to Hornsund a special experience.